I spend a lot of time trying to make sure that the classes, demos, equipment, consulting and other VO services I offer are effective and useful, but ultimately, affordable and a great value. Because I know how hard it is sometimes to make ends meet, especially for performers, and to make sure your money goes as far as it can. That’s why I get so angry when I see something like this. And I rescheduled the post I had written for today, about getting out of management contracts, because I wanted you to be aware of this. And if you would, please forward this to every actor you know – this is asinine. Inside the email, was an offer to find you auditions and roles. Do not respond to this. It is a scam. It may be obvious to most of you, but on the off chance that you’re desperate enough to believe that someone working from home in Iowa is working for MGM, Disney and 20th Century Fox, all at the same time, in the capacity of Senior Talent Coordinator & Lead Writer can, for the discounted price of $100, get you roles in all those types of work…don’t. Hi. Many of you actors already know who I am. For those who don’t, my name is Marq Thompson. (Or some know me by Marq Lorenzo) I am the Senior Talent Coordinator & Lead Writer for MGM, 20th Century Fox, & Disney. I am not a 3rd Party talent agency. I am the lead writer which happens to also do the composing for all Univeral music as well. I am writing to let people become aware that it’s been over 10 years since we’ve allowed new-coming actors and to open up to the public however it has has been long overdue. We will be having our eligibility drive the first week of July. If it is a success then we are hoping to have it July, august and September. But after that it will go back up to the regular rate of $500. If you’d like to be considered for any roles then overnight your gift payment of $100. That’s a $400 savings. Please do not send any paper resumes! Everything is done electronically. On a separate piece of paper you’ll state your real name & contact as well as your link to your online resume. If you don’t have a resume then just post your stats and pic to a wordpress or blogspot. I like pdf or downloadable formats if possible. If you are 17 and under please have your parents sign a note stating you are eligible and have them sign their full name and 1-2 contacts in case I need to call them to verify. We do have roles for all sorts of people. We prefer ages 5-65 years of age. But if you think you can act we will look at all submissions. If you have any youtube 2min excerpts then write the link down. If you are already a top known actor playing lead roles then that probably won’t be necessary. All new actors are welcome to apply as well. I wish all of you the best. I want to take this time out to thank are veteran actors for such a job well done. Your acting has been nothing but awe-inspiring and is sure to leave an indelible impression on humanity for years to come. You ALL are a hero to someone, somewhere out there. I’ve got to make this short, however if and when we call you by phone then you can receive extra ranking points by leaving 2-10 references of people whom you think would like to act. The only other thing is a timely submission and to be patient. Don’t get bent out of shape if you missed the pre-eligibility registration. It isn’t solely based on being the early bird, but it can definitely help. (Often roles are sometimes reserved to even out the scale by ethnicity and age group— for example we are probably going to add some vietnamese and bosnian melodramas. You would need to state that you can speak english even if you are another ethnicity) If we are lacking qualified applicants we may postpone or utilize actors of similiar decent) the key is to just be ready because you never know. Okay. This is a real eligibility offer. God Bless and God Speed! I know I said don’t fall for this, but let’s do one thing that Marq/Marc/Marques/L. Marques asked. I’m forwarding this to SAG-AFTRA, and the legal departments of the organizations mentioned. Any scams we should know about? In the comments below, let us all know of things you’ve seen or have been sent. Help keep you and your fellow artists safe. Thank you David, this is great. I think I saw “Marq” on one one LinkedIn groups where folks were telling him off. Will forward this as well. Can’t he be arrested for this? I would think that Disney, etc…would sick their lawyers on him immediately! David this is hysterical! The egregious spelling and grammatical errors alone cracked me up. Thanks for the heads up. Good man, David! So many scam artists trying to take advantage of this industry. Thanks for sharing this warning with everyone! Thanks for posting this David. These kind of emails are as bad as the people in Africa preying on little old ladies. There is another one out there who is using the TURN YOUR HOBBY INTO A MONEY MAKING MACHINE” by buying leads from them every month. Too many predators messing up our industry and now using VO as a work from home scam. Glad you are on the look out to hold these people accountable. 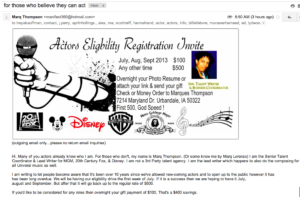 Thank you for alerting actors to scams such as this! It is sad to think about how many people have fallen for this type of fraud. Thank you so much David! This guy sent me a request on LinkedIn. …I’m not only going to block him, but I’ll post this on LinkedIn as well. I appreciate the heads up. His grammar is a dead give away, but, you never know these days. 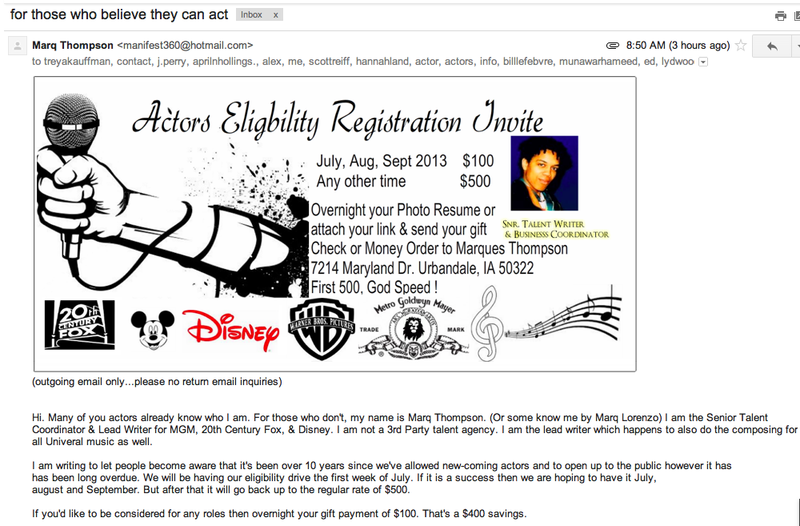 Thanks for sharing this rather humorous attempt to scam those who are desperate for a big break. Those who are naive enough to fall for this scam are this scammer’s unlawful prey. Are you sure this is a scam? If this fellow really is a lead writer at three major studios, his grammar and usage would explain a lot about the current quality of popular entertainment. Majority of first time actors (stage, tv/film, vo) are ripe for the picking from these scam artist. We need more warnings like this to keep folks aware of how they can be taken advantage of. Thanks for looking out, David!